Yes, it's true! The reclusive UK rockers are back after a nearly three and a half year hiatus. 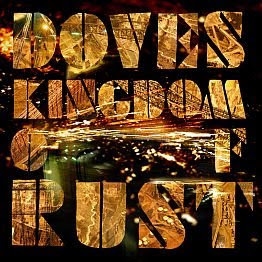 Doves will be releasing their newest record, entitled Kingdom of Rust, via Heavenly Recordings on April 6 in the UK. No official word on a US release date as of yet, but I'd say that April 7 is a good bet. The band sent out an email this morning which included the album's 11-song track list and a list of dates for the mini-tour they'll be doing in the UK in March. If you click on over to the Doves website you can get all the aforementioned info and download the album's opening track "Jetstream". The band describes this track as the . "..imaginary song for the closing credits on Ridley Scott's Bladerunner...", which pretty much hits the nail on the head as far as I'm concerned. If you're interested in hearing a bit more of what the Doves have in store for us come April, check out these live recordings of some new songs, including "Jetstream" and the title track, that were taken from a one-off show towards the end of last year. The band is planning on touring the US later this year, although there are currently no dates announced. It's been a long wait since the last Doves record but, from the sound of it, it's been worth it.